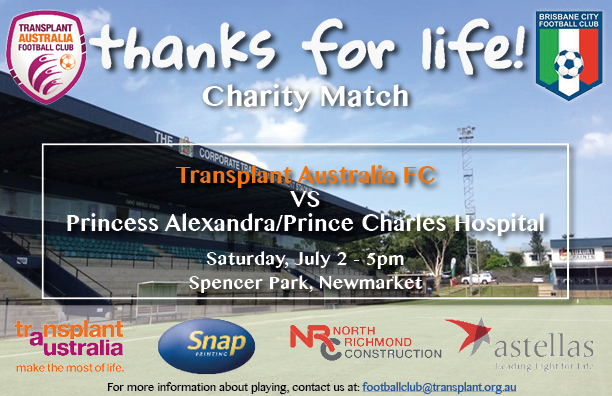 This Saturday join us for a friendly game of soccer, with the Transplant Australia Football Club versing staff and researchers from The Prince Charles and Princess Alexandra Hospitals. For just a small donation, you can come along and support both sides of the game; those celebrating their second chance at life, and those working hard saving lives. Organ donation still remains a major priority in Australia, with up to 1,500 people on the transplant waiting list at any one time. The only way we can battle these statistics is by increasing awareness and focussing our efforts on researching new organ transplant technologies. The Transplant Australia Football team match commences at 5pm and will be the curtain raiser for the Brisbane City and Western Pride Australian Premier League match, at Spencer Park Newmarket. A portion of the proceeds from the match will be going to crucial organ transplant research at The Prince Charles Hospital.